A new stainless steel sink sparkles, but as it gets used that bright shiny finish becomes dull and stained. Well, the good news is that you can restore that clean, shiny finish with a few easy steps. Some of you are probably still using the commercial stainless steel cleaner that the manufacturer recommended, and that works, but who knows what is in that stuff? If your sink, fridge, oven or other stainless steel appliances are dull and stained, start with a full restoration, then use my regular cleaning method on a daily basis. If your sink is new, you can probably just begin with the regular cleaning to keep it looking new. Try to tackle stains quickly to make the job easier. I keep a small plastic container in the sink for dirty silverware, knives, cloths, and sponges. I add a little hot soapy water to the bowl as I begin to cook, and I empty the bowl into the dishwasher after each meal. This prevents scratches in the sink and soaks off any stuck on food. Every night, when the dishes are done, I clean my sink thoroughly and buff it dry. This only takes a few minutes, but it does a great job of keeping my sink in good shape. First, I rinse the sink to remove all food particles and debris; then wash the sink out with soapy water. I choose a mildly abrasive cleaner and a soft cloth, sponge, or cleaning pad to apply the cleanser. You have many good natural abrasive cleansers to choose from without resorting to chemical cleaners. Choose one from my list or use your favorite. Scrub the stainless steel with the grain lines. Scrubbing against the grain can leave tiny scratches that dull the finish. Don’t forget the faucet and all the tiny crevices around the faucet. Use a soft brush or an old toothbrush to get into all the little crevices. Rinse the sink and faucet, then dry it with a clean cloth or paper towels. If you skip the drying step, you are likely to have water spots ruining that shiny surface. Using this method, your sink will stay clean and naturally shiny for a long time. >> More kitchen sink tips: Best way to unclog a stainless sink drain. Most stubborn stains are caused by leaving a stainless steel or cast iron utensil in the sink for a long time. These can cause rust stains to form where the metals contact. Prevent stains by keeping the sink empty and clean. When stubborn stains do occur, you have a few choices. My preference is to use my Heavy Duty Stainless Steel Sink Cleaner and apply a little elbow grease. This cleaner often used to clean grease off a stainless steel stove, is a safe and effective abrasive that also disinfects the sink. Stir the ingredients together to make a bubbly paste, then apply it with a cloth, sponge, or a soft brush. Rub the stain with the grain or in small circles until the stain is gone and the surface is clean. 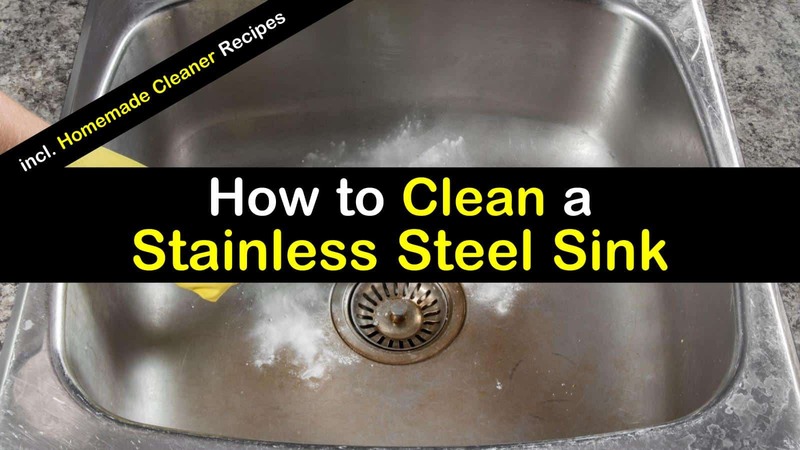 Rub down the remainder of the sink and let the homemade steel sink cleaner recipe remain on the sink surface for a few minutes to have time to disinfect the sink. Rinse the sink and buff it dry. We don’t like to use bleach on stainless steel because it can damage the sink and cause more stains. My favorite sanitizing method is to spray the sink with vinegar, then with hydrogen peroxide. Either of these alone does a good job of killing germs, but together they form an even more effective sanitizer. I usually sanitize my sink before I buff it dry, but allow the vinegar and peroxide to sit on the sink surface for a few minutes for the full effect. If your sink is dull, stained, and badly scratched, it may be time for a full restoration. Start by following the instructions for everyday cleaning and the instructions for removing stains. Once your sink is clean and stain free, examine it closely for scratches and marks that are dulling the finish and notice the direction of the grain. Vinegar will remove water stains, but usually, the problem is due to scratches that mar the finish. For the best finish, you need to remove these scratches by buffing the surface and adding new tiny scratches that go with the flow of the grain. Use an abrasive cleanser or, if the surface is badly damaged, 240 grit sandpaper and lightly scrub in the direction of the grain. Use a light touch and be careful to create only tiny scratches that flow with the natural surface. Rinse the surface and repeat the process as needed, finishing with an abrasive cleanser. Dry and buff the sink surface with a microfiber cloth. Then shine it up with a little dab of baby oil, mineral oil, or cooking oil. Use just enough to give shine without leaving a greasy film. I hope that these tips help you restore your sink to its natural shine and keep it clean. If you have pinholes in your sink, or if the rust is deep or the sink is pitted, you need to contact a professional. 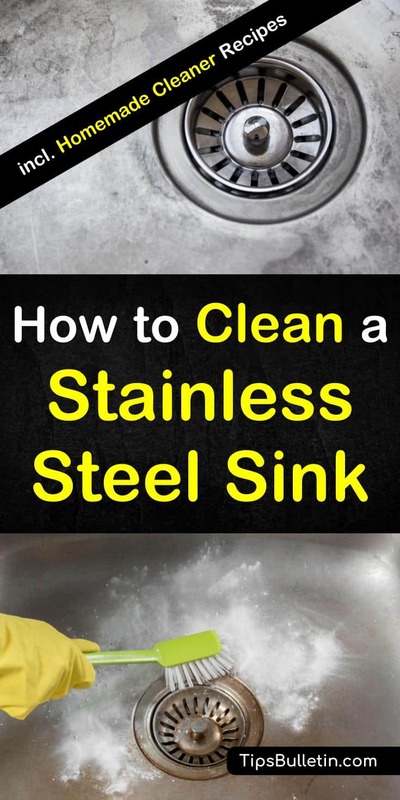 A stainless steel sink can give you many years of use if you treat it properly and keep it clean. Unfortunately, sometimes you move into a situation that is less than ideal, so give these tips a try and let me know how they work for you. If you use another method that works well, please let us all know by leaving a comment. If this article helped you, consider sharing it on social media so that others may benefit. Let’s work together to make housework easier and create more time for the activities that give joy to life.